This fifth issue of the free FactoryMag in-depth interviews, previews and advance news for the Stoke Your Fires film festival, plus an events listing, and funding news. There are also advance details of the Local TV broadcast service, set to start in Stoke-on-Trent in 2014. Note that if you use the popular Foxit PDF Reader to read PDFs, you will need to enable clickable Web links in PDFs. To enable links in Foxit go to… File | Preferences | General, and then Uncheck “Make Hand Tool Select Text” + Check “Create Links from URLs” | then click OK.
Stoke-on-Trent’s bITjAM has a competition ahead of the launch of their Innovation Qube, set to open on 7th March 2014. The IQ is a new equipped space at the YMCA in Stoke-on-Trent for young people to investigate innovative technologies. The Qube competition asks you to think of how to use technology in an innovative and fun way, to solve an everyday problem in your school or company. Growth Vouchers have just been launched. These are £2,000 vouchers, for small businesses to spend on independent specialist business advice for your small business. Advisors must be accredited by a bona fide trade organisation or industry body. 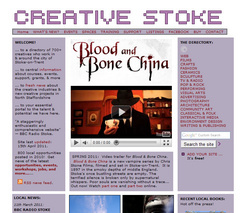 Stoke-on-Trent’s Appetite now has details of the Kitchen programme to develop new artworks for public spaces. Kitchen aims to… “be a place to cook up new projects, develop new ideas and share practice with other artists” and local people. There are several strands of Seed Fund and R&D funding. Application deadline: 10am on 5th March 2014. Further funding rounds are planned for July 2014 and September 2014. See the Web page for full details. Appetite and the Stoke South Carnival Committee are seeking an artist, group of artists, or arts organisation “to capture the imagination” of local people on a First World War theme, for an annual Carnival in Stoke on 9th August 2014. Artist brief | Commission application form. Application deadline: 10am, 24th February 2014. Stoke-on-Trent’s SWOCA are now looking for artists to take part in this summer’s London Road Festival in Stoke town, Stoke-on-Trent. NASA is set to land in Stoke! The National Association of Street Artists (NASA) is having its annual general meeting and gathering “For The Love Of It” in the city on 21st — 23rd February 2014. Two days of inspiration, creation, and skills sharing at the annual gathering for UK street arts professionals. Cost is £33, and NASA membership is reportedly not required for attendance. Staffordshire University’s The 72 Project requires two students to each serve as a Production Assistant, as part of a three day feature film shoot in Birmingham in July 2014. £400 tax-free bursary on successful completion of the project, per person. Application deadline: Friday 28th February 2014. Projects begin in March and run until 30th May 2014. The case study charts a member of the public’s journey in experiencing art/art events with reference to Appetite, a three year Arts Council-funded project. There is a £300 tax-free bursary on successful completion of project. Application closing Date: 27th February 2014. A new five-week creative ceramics course is set to start on 12th March 2014 at the Burslem School of Art, Stoke-on-Trent. The course will run Wednesdays, from 6.30pm to 8.30pm. Full Fee is £20, with JSA, ESA and Income Support Claimants paying £16. See the Web link for details and booking. Stoke-on-Trent’s Prototype magazine is seeking “someone rather lovely, talented and inspired to assist in our new direction”. They need bloggers who can write, interview and source creative inspiration to feature on the Prototype blog. Interested? Email info@prototype-mag.co.uk with a link to your current blog or a piece of your writing. There’s an excellent feature article on Stoke-on-Trent’s ceramics renaissance in the latest issue of Monocle magazine (Feb 2014). The revival of the Potteries also featured on Channel 4 News (video link). Ceramics historians might be interested in a one-day conference being held on the other side of the Peaks, in Derby, on 21st February 2014. The 2014 King’s Market (King’s Hall, Stoke town, Stoke-on-Trent) is inviting applicants for a 6′ pitch from just £30, for their 23rd March 2014 event. Interested? Email@ markets@stoke.gov.uk for further information. Job: The Brewhouse Arts Centre, Burton-upon-Trent, requires a casual dance worker (15 hours per week). Job: The Lichfield Festival is seeking to appoint a freelance Artistic Director to devise and programme Lichfield’s October 2014 Literature Festival and Lichfield Festival in July 2015. Fee: £12,000. Application deadline: 21st February 2014. Shrewsbury Folk Festival requires unpaid Children’s Festival Directors. Application deadline: 21st February 2014. Staffordshire University has formally announced it will move more than 3,000 students and staff to Stoke-on-Trent, from its old Stafford campus. This will mean a large influx of computing and videogame development talent into Stoke-on-Trent, probably by Sept 2015. The university is said to have around 500 students on the videogame courses, and a new Epic Games Centre funded by Epic Games (developer of the world-leading Unreal Engine videogames engine).